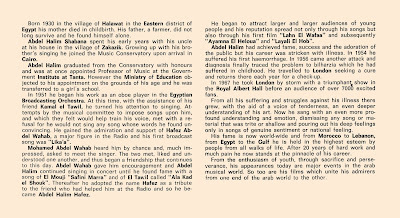 Ladies & gentlemen, we're leaving Egypt today after a few weeks in the compagny of Abdel Halim Hafez. Our next stop will be in Thailand and it's amazing music! As we're now flying over Lebanon, let's enjoy LES PLUS GRANDS ARTISTES DU MONDE ARABE (Music For Pleasure M046-97804 from 1976). 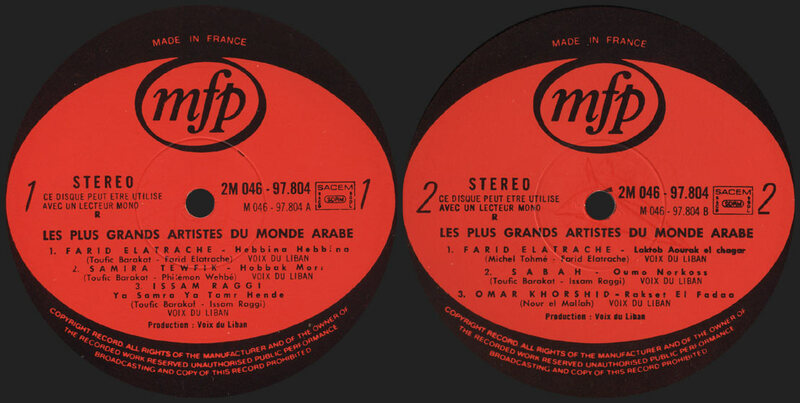 This LP is a great compilation featuring some of the most famous lebanese singers from the 60's to mid 70's (and also Omar Korshid from Egypt). Mandolins, darbukas, electric guitar, great vocals... 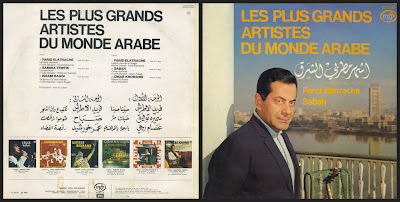 This record is a perfect introduction to lebanon 70's music, modern and traditionnal at the same time, I guess many people who bough it when it first came out had hard time trying to get some more. 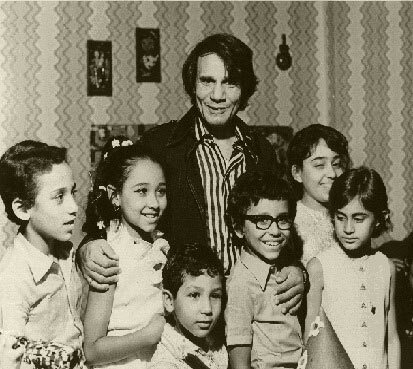 This is our last week in compagny of Mr Abdel Halim Hafez. 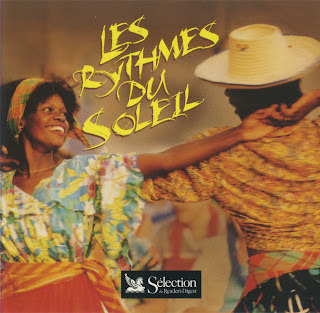 There is not much to add to the previous posts exept: AAIT DAMAIT HOZEN...LA (Soutelphan records GSTP34, from 1974). This is our second week in Egypt with Abdel Halim Hafez. This week we get some kind of a conceptual recording. 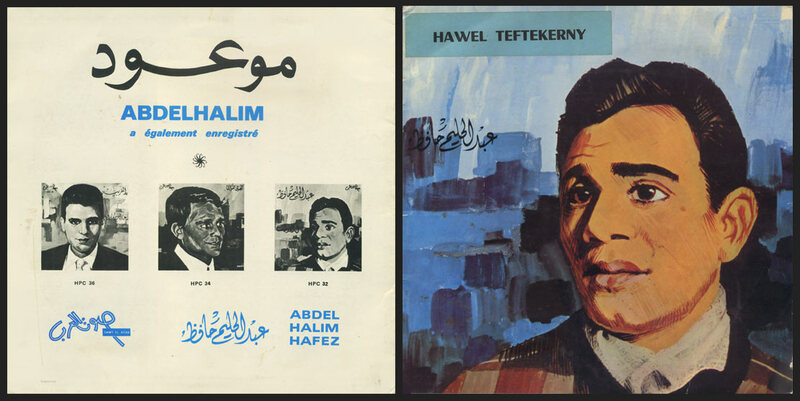 HAWEL TEFTEKERNY (Sawt El Arab, HPC 10007 from 1974) is a live recording. 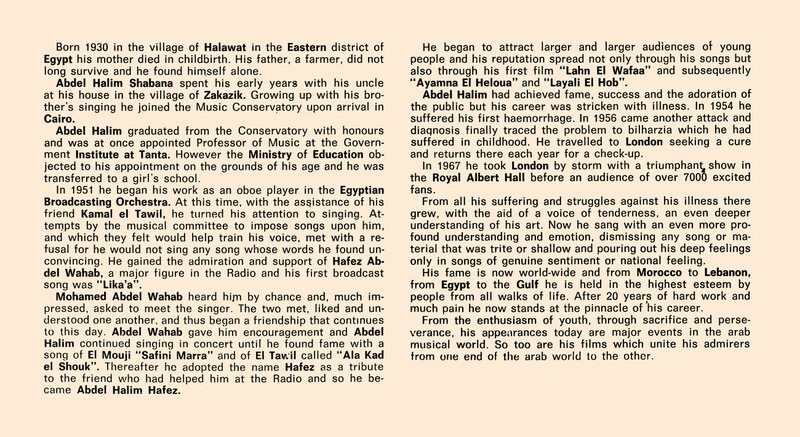 In the last years of his career Abdel Halim Hafez focused mostly on live performances so most of his recordings where from concerts (usually also broadcasted for tv). Unlike most Egyptian singers of this era Abdel Halim Hafez opted for a new way of composition of long musical pieces instead of the commercial "7' inches" format. 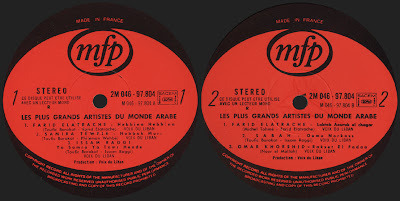 This record features 42mn from the total performance. 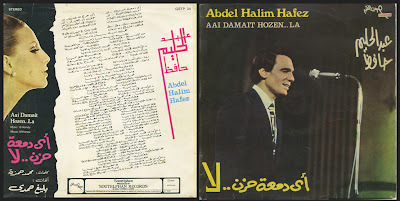 On this piece Abdel Halim Hafez's composition flirts with occidental opera and Arabian poetry and mixes many instruments to his original Arabian folk songs style (electric guitar, organ...). 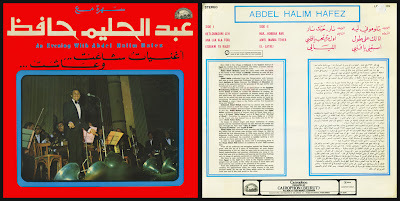 This "classicist genre" was concidered to be a new step in Arabian music, a way choosed by a few other musicians including Oum Kalthoum that disappeared a few years after the death of Abdel Halim Hafez. Ladies & gentlemen, after a few busy weeks leaving you with some CD compilations, your captain is back on duty! 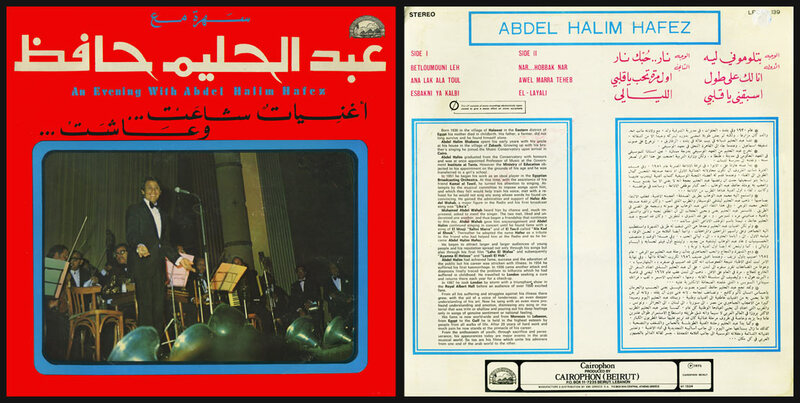 We'll start this homage serie with AN EVENING WITH ABDEL HALIM HAFEZ (Cairophon, LPCXG139 from 1973). 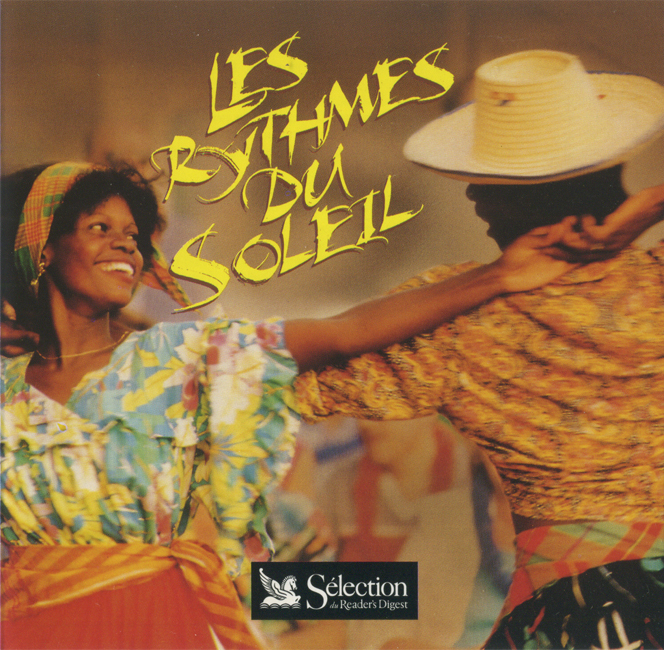 Though the name and cover picture would let us think about a live recording this brilliant Lp is made of studio sessions. 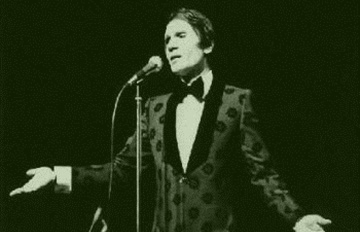 Don't worry, the next 2 weeks will focus on some of Abdel Halim Hafez (عبد الحليم حافظ) live performances. Better than telling you about his successful career, let's read the notes from the cover and some online informations (note that Abdel Halim Hafez died only a few years after this recording). We'll get a bunch of luxurious songs featuring wide orchestrations including occidental and oriental influences. 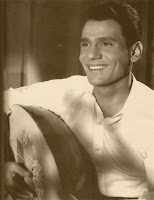 As usual Abdel Halim Hafez combine his voice and instruments with talent, mixing modernism and tradition, incorporating various kinds of instruments: Mandolin, saxophone, electric guitar, organ, accordion, both arabian and occidental strings, piano... (not especially in today's recording but in the whole serie of recordings). Grab a cup of tea, some dried fruits and start to whistle along with "el-Andaleeb el-Asmar" (The Black Nightingale) as his fans in all the arabian world would call him. 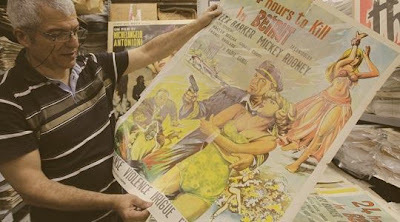 Ladies & gentlemen, this is NOT your captain speaking! The captain is going to be busy for a little while and better than stopping our journey he prefered to set things to "auto-pilot".